Thank you Shy for this tag, I enjoyed answering them. 2. That John will be picked up for promotion. 3. Visit Philippines again before we go back to States. 4. To go to Japan for a visit hehehe. 5. Paying off our debts. 6. Hearing my son talk in full blast hehehe, but he is getting there. 7. To be with our family back home. 8. Be a US Citizen. 1. Took nap because of head ache. 3. Did some blogging opportunities and hop around. 5. Watched TV with the kids. 7. Read a book to my makukulits. 8. Did some laundry and folded them. 2. Help my siblings financially. 3. Visit Singapore, Malaysia, Hongkong and Australia hehehe. 5. Bring Mama in the States. 6. Stop war and spread out peace through out the world. 7. Magic,... so i can make a lotta money to give to my family. 8. Stop those pirates from attacking innocent people. 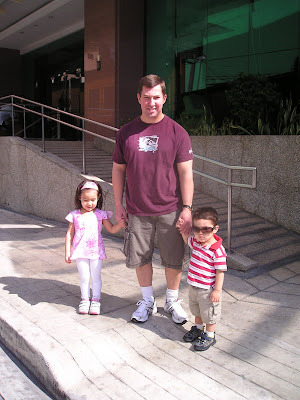 My son love to wear my sunglasses when we were in the Philippines hehehe..Picture taken in front of the Oxford Hotel where we stayed in Manila..
parang yung wish and like mo the same ng ideas ko! Hmmm.. I wonder.. may debts ka pa? When are you going to be a US citizen? Di ba automatic yun? was here visiting, rose :-), ka cute naman tingnan ni Ej wearing yung sunglasses mo! Eose, I was here again, visiting :-) and dropping ec, take care! Thank you for tagging me I love this one. wow! !meron na naman akong tags! !Thanks a lot! !Sana makapunta ka dito sa Japan! parehong -pareho ang wishes natin ah! masarap yung #7 sa things looking 4ward to, wala ng sasaya kung kasama mo ang pamilya di ba? kasama ba ko dun? hehehe! Wish ko din makapag travel around the world. kaya lang walang datung heheheh! Pag nagka magic ka penge din ako pera ha? para naman maumpisahan ko na yung pag travel around d world. lol!